Chuwi is taking aim at Microsoft with their latest tablet hybrid, the Hi13. 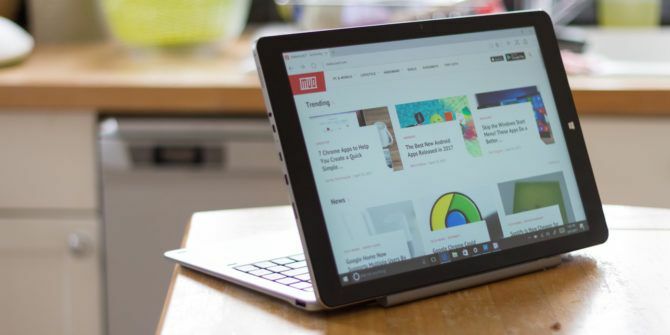 Despite a massive 13.5 inch, 3K resolution multi-touch display and detachable keyboard, the Chuwi Hi13 won’t break the bank – it’s just $350 for the tablet alone, or $420 bundled with the keyboard and active stylus. Unlike the 14.1 Lapbook though, the Hi13 has a 13.5″ multi-touch display, running at a native resolution of 3000 x 2000 pixels (3:2 ratio). With a pixel density of 267PPI and 480 nits brightness, the screen specs exactly match that of the Microsoft Surface Book, but at a fraction of the cost. The internals aren’t as good as the Surface Book, but are they $1000 worse? Not at all. Ports sit at the left, or top of the device respectively, depending on whether it’s held in landscape, docked with the keyboard, or being held in portrait mode as a tablet. There’s a USB-C port for charging, with either the included AC adaptor, or the included USB->USB-C cable, so you can use any standard phone charger you have to hand. There’s also an array of micro-sized ports: a microSDXC for storage expansion, micro-USB, and micro-HDMI. When docked with the keyboard, an additional full size USB-A port is provided on both sides. With an all metal chassis, both for the tablet itself and the keyboard, this is one seriously classy looking bit of hardware. While the Lapbook 14.1 opted for cheap and cheerful, the Hi13 isn’t going to show you up no matter where you take it. The metal keyboard features deep black keys, with a good amount of travel and satisfying clickiness. If I was forced to write on a laptop, I’d certainly be happy with this one. Attaching to the tablet via some simple magnetic latches, the Hi13 can also be attached in reverse (with the rear of the tablet toward the keyboard). In this mode, the keyboard can either be used as an adjustable stand, or fully tucked in behind the tablet and not worry about accidentally pressing some keys or damaging them when you put the tablet down. My only minor gripe with the keyboard is that the trackpad is annoyingly overactive. Moving your fingers from the keys down the trackpad invariably ends up triggering the minimize all windows gesture. You can probably tweak this in Windows 10 settings. Combined with the Hi3 or Hi1 pen device, Windows is transformed by note taking and handwriting recognition. Offering some degree of pressure sensitivity, taking notes and drawing is rather fun. Unlike some cheaper tablets, I had no problems with missed strokes. With stylus features enabled by default, Windows also offers handwriting recognition for input. While amusing for a short time, I question the long term value of this, particularly for already fast typists or those with horrendous handwriting skills, such as myself. If can write faster than you can type though, you might find this feature very useful. It is worth noting that the screen is not fully laminated, so there is a small gap between where the pen hits the screen and where the display is. This is problematic for detailed sketching and artistic endeavours, but shouldn’t matter in normal usage, for most users. However, this is not a replacement for a Wacom Cintiq drawing tablet by any stretch of the imagination. The Hi13 comes with a stock image of Windows 10 and mercifully lacking any of the usual bloatware. A default profile named “cw” is given out of the box, so there’s no delay in actually using the system if you want to jump right in. After associating your own account, you can enable Cortana too and enjoy the full Windows 10 experience. That said, we wouldn’t bother with Cortana. Recognition accuracy was good, but she’s still quite stupid. The problem with running such a high resolution is that it can introduce some lag on the general UI. We could sometimes see the Windows start menu stutter a little as it slid upwards, or when minimizing apps. Appearance of that was inconsistent during testing however, so it’s possible Windows was doing some intensive background tasks that it didn’t want us to know about at the time. Geekbench 4.1 scored the CPU at 1377 single core, 3925 multi-core, and the GPU at 8088 – about what I’d expect from raw performance testing. This is almost identical to the Chuwi 14.1 Lapbook (tested with Geekbench 4.0), which is understandable given the same internals. The device is listed as compatible with Ubuntu, though we didn’t test this either because it appears to be lacking touchscreen support (but if you want to try, these threads should help). At this point, I feel it’s also worth noting that between this and the Chuwi 14.1 Lapbook I reviewed last month, we’ve never experienced any reliability issues on Chuwi devices. This is in stark contrast to the Teclast tablet that we bricked while running their official firmware update (and were then unable to restore, because the firmware download links had expired – a problem other users mentioned in the comments Teclast TBook 16 Pro Hybrid Dual-Boot Tablet Review and Giveaway Teclast TBook 16 Pro Hybrid Dual-Boot Tablet Review and Giveaway The Teclast TBook 16 Pro is a hybrid tablet with detachable keyboard that dual boots both Windows 10 and Android 5.1. The tablet is available for around $200, while the keyboard is an additional $50... Read More ). The only real disappointment were the speakers. They’re stereo, and apparently there’s even four of them in total, but as well as lacking bass, the volume just seemed awfully quiet. They’re fine for personal viewing, but you’d have trouble using this as a central media device in a group setting, as background noise would likely drown out the volume. Our stress test was to run the Hi13 on full volume and maximum brightness, with battery saver off, streaming from BBC news over Wi-Fi, on Microsoft Edge. The Hi13 managed just under 4.5 hours before the battery was fully depleted, though battery saver turned itself on when 10% was left. Given that the screen is the biggest drain on battery, using an adaptive brightness and enabling battery saver should give you another 1 or 2 hours on top of that. Charging to full took around 2 hours using the supplied fast charging USB-C wall adaptor. We appreciated the inclusion of a standard USB to USB-C cable, so we could charge from any phone charger even if we forgot to bring the fast charger. Should You Buy the Chuwi Hi13? At $420 for the tablet, keyboard and stylus bundle, we think the Chuwi Hi13 represents great value for money. You’re getting a massive multitouch display, reasonable internals, and long battery life. Coupled with a gorgeous classy metal design, the easy to handle keyboard and stylus make the Hi13 a fun device to use. Making full use of the stylus input features will require you to re-train the way you use a tablet, but you might find performance gains. Lacklustre speakers are the only thing holding this back from a perfect score. If you need the most powerful and big tablet around that can even run games, and don’t mind spending more, you’re probably better off with a Microsoft Surface Pro 4. That’ll set you back over $1000, however. If you’ve been looking for something that resembles a Surface Book, but don’t need quite as much raw power, we think you’ll be quite pleased with the Chuwi Hi13. Explore more about: Chuwi, MakeUseOf Giveaway, Windows Tablet. Hi this seems pretty good alternative for surface pro. Just wondering, can you lower the screen resolution to improve performance? Who's the winner? Is it a fake givaway? No, it was the weekend. Today is the day? I hope luck got my back today? Do I get T-shirt too? Amazing tablet, many thanks for the review!! This one would be perfect for my job. As a artist ans surface pros are not affordable, this tablet is a great bargin! Thanks for the review. Im quite worried about the speakers. But not everything comes perfect for that price. "Hi" which is better, the hi13 or the teclast x5pro?? "HI" i had a Chuwi hi10 for a year before it died. i really loved that tab. PLZZZZZZZZ PLZ PLZZZZZZZ PICK ME!? Is there anything upgradeable on this unit, i.e. RAM or SSD? This device is more than Tablet, it is a real companion should be own by everyone especially those who cherish and appreciate quality.From the preview,it outclassed other devices in the market, I love it and praying to have one.